2.2.1 How to SELECT random row in Oracle with ROWNUM? 5 What we learned today? The SELECT TOP tells the database to return only a certain number or percentage of records. Select TOP is useful when we are querying a large table I.e. table with thousands of rows, we can use TOP, LIMIT or ROWNUM to restrict the resultset. There may be variations in the SQL Query based on database vendors. Here is the syntax based on various relational database providers. Let us create a table and insert some rows into that table. Now, let us see how the table looks like. The DESC command shows the structure of the table. It shows column datatype, whether we can insert NULL values into the respective columns or not etc. We can tell Oracle to display only first n rows. The ROWNUM helps to achieve that. So, what is rownum in Oracle? 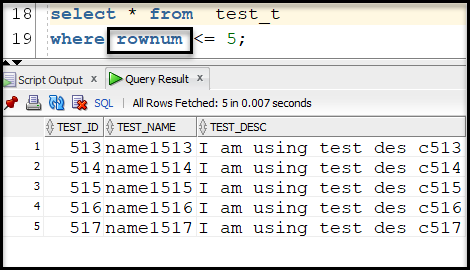 ROWNUM is a pseudo column in oracle which contains the row number of the respective rows. Here is the query to display only 5 rows from the table. The output is shown in the below figure. How to SELECT random row in Oracle with ROWNUM? We will use dbms_random.value along with the ROWNUM to get a random row each time the query is executed. Let us try to understand this query. There are two things to notice in this SQL query. select test_id, test_name, test_desc from test_t order by dbms_random.value will sort the rows in random order. Each time the query is fired, Oracle returns the data in different order. 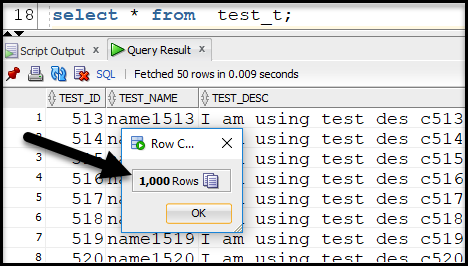 This resultset is the input to the outer query. select * from ( ….OUTPUT_FROM_ABOVE_POINT… ) where rownum = 1; this statement selects the first row or the row with the first row. Just like the ROWNUM in oracle, MySQL uses the LIMIT clause. It tells MySQL database to restrict the resultset to N rows. Here, the value of N is 5. 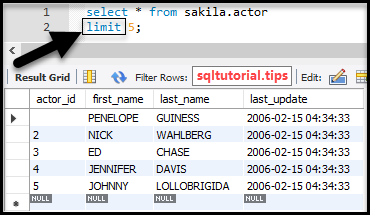 Here, sakila is the container or schema for actor table. As, the limit is set as 5, we have 5 rows in the output. These are the top 5 rows of the table. ROWNUM, LIMIT do not work with SQL Server or MS Access. Here, the database uses the TOP command. 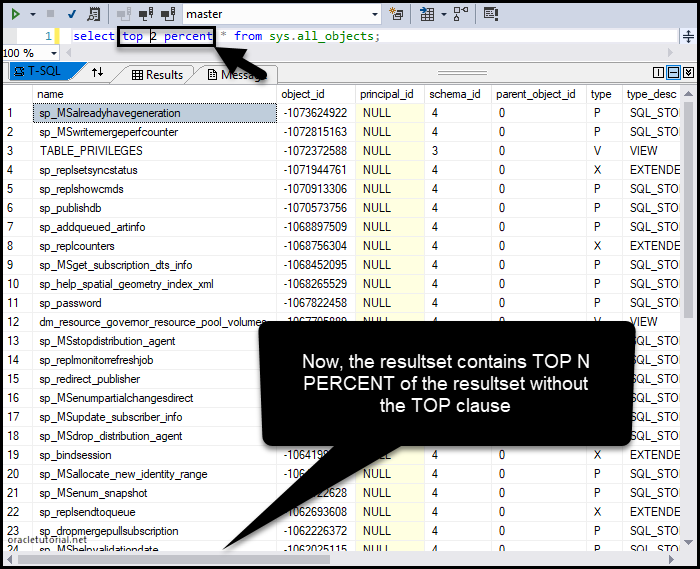 The SQL TOP keyword tells the db to display or fetch only top N or N percent of the data without TOP clause. The output of the above query is shown in the following figure. We can use the PERCENT keyword along with the TOP N to display only certain percentage of rows from top. The resultset displays only 2 percentage of whole rows. I have used Oracle, MySQL, SQL Server to demonstrate in this post. Please share your thoughts, queries or suggestions in the comment section below.